Not a big deal, right? Wrong. Check out the still of the scene in question. But noooooo, it doesn't. If you look closely (you honestly can't see it that well in the image, but just trust us on this one), the poster's not even for Super Bowl 16, which would've been the game played in 1982. In fact, the Super Bowl poster isn't even for 1983, which would've been Super Bowl 17. Not even close. That poster is for Super Bowl 22, the game that took place in 1988 -- literally six years after the release of the film. We only assume films are set in the year they're released -- or at least, well, filmed. A common misconception. Oftentimes we can honestly tell that a film is set in the future, though -- or the past. I mean, look at BACK TO THE FUTURE, for crying out loud. 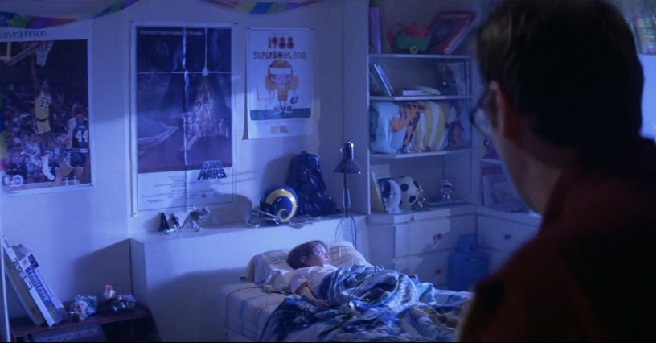 But for all intents and purposes, it's still a little odd that we're looking at a supposedly real poster of Super Bowl 22, and the film wasn't even shot in that year. That's not all, though.... That's not even the freakiest part. 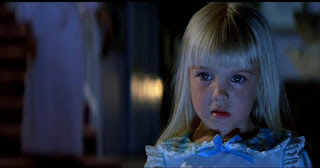 You Remember the Infamous Little Actress, God Rest Her Soul, Who Played the Great Carol Anne, Right? Super Bowl 22 took place on January 31st, 1988. Got it? Good. Would you like to know exactly when O'Rourke fell ill mysteriously? Don't freak out: January 31st. 1988. Bear in mind that this is something having occurred six years after we get to see that freakin' poster in the original film released in 1982. Coincidence? Again.... Maybe. But guess what: it gets even weirder. Want to know when and where Heather O'Rourke suddenly died after falling ill? ....The very next day. February 1st, 1988. She kept vomiting, finally rushed to the hospital on that January 31st. Sadly, Heather suffered cardiac arrest due to septic shock caused by intestinal stenosis. It happened all of a sudden. She managed to live until the next day. But dear God, would you like to know what else is so freaky about the story? She ended up dying in Rady Children's Hospital. In San Diego, CA. Where Super Bowl 22, in fact, took place just the day before! Say It's a Coincidence All You Want, But There Are Way Too Many Variables for Anyone of Right Mind to Stick to That Mundane Sensibility. Seriously. It does, in fact, lend to the supposed Poltergeist Curse everyone seems to talk about. The movie was cursed. Is cursed. Crazy cursed. How in the Hell can there be a poster that just so happens to be of Super Bowl 22 in a film released in 1982, and the lead actress of the entire film suddenly gets sick on the day of that exact game and then dies in the exact same city? It's crazy Nostradamus crap going on. Who's idea was it to use that damn poster in the movie anyway? Maybe it was a hidden message or a sign that O'Rourke was going to get sick on that day.... And then die in the same area on the following day.